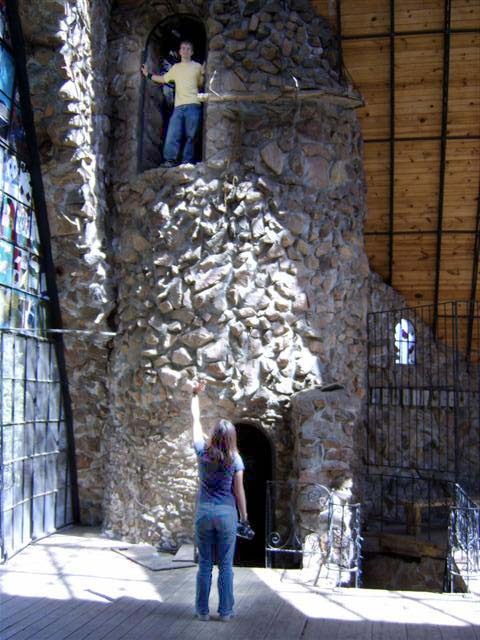 On May 13, 2006 (Day Two of our great road trip), we visited Bishop's Castle in Beulah, Colorado. It was just so cool that we felt we had to give it its own page. 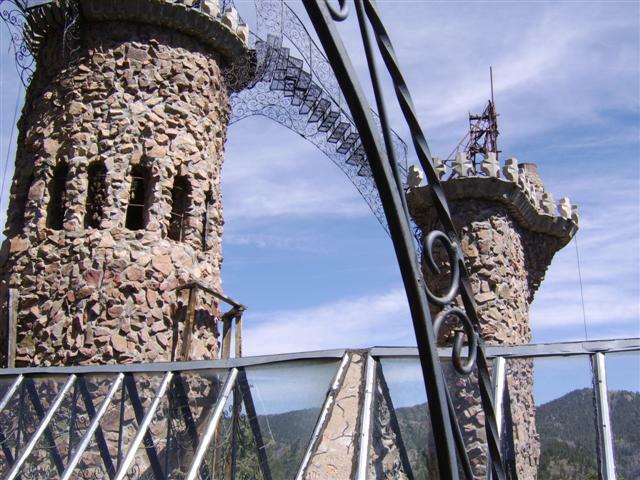 Started in 1969, Jim Bishop, the guy who built the castle, calls it the "World's Largest One-Man Construction Project." 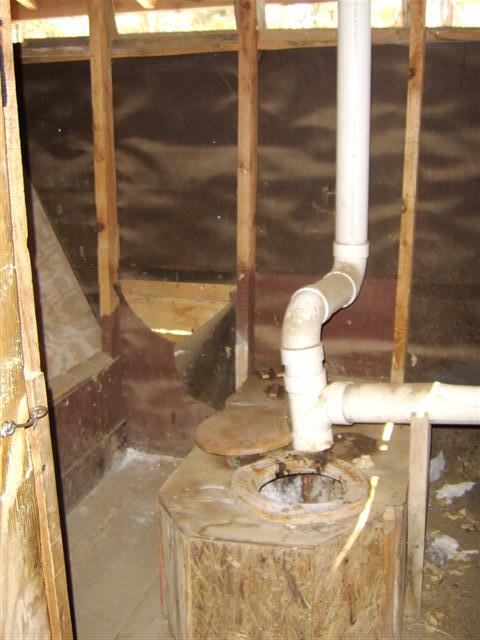 Although there are rumors Jim's late father did a lot of the work, he claims he built the entire thing himself. Jim is kind of a nutso militant liberal, or perhaps a Libertarian. Either way, there are crazy political signs all over the property. This external view of the castle doesn't begin to capture the sense of enormity you get by standing next to it. I just couldn't get back far enough to get it all in the frame without being in the forest! This thing is gigantic. On the left, you can see several large stained-glass windows; inside is a huge open church-like sanctuary. Apparently, there used to be public raves in there, until some jerk got drunk and brought a gun. 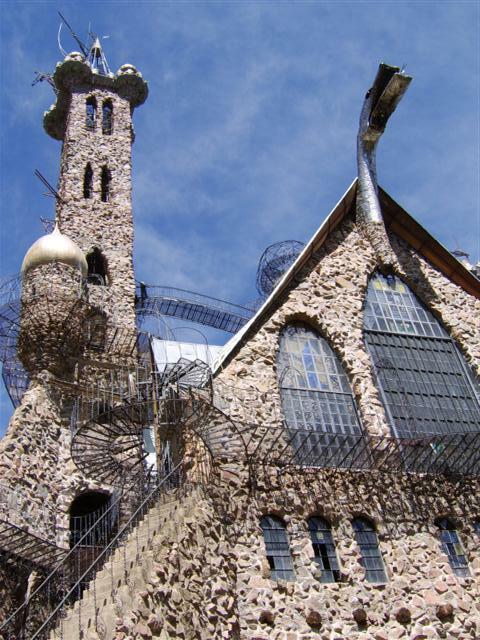 Above the stained-glass windows, a huge metal dragon head extends from the top of the roof. Supposedly, the dragon belches forth propane-powered flames! 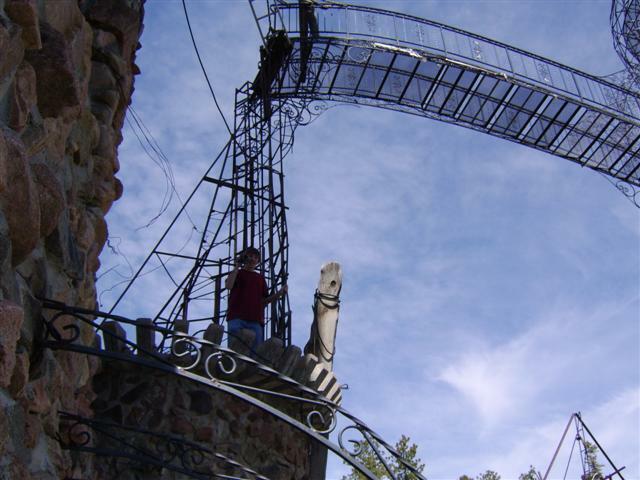 Hand-welded iron walkways cover the castle, connecting parts to other parts in an extremely precarious setup! The castle features three huge spires. The first is well over 100 feet tall, way taller than the Genoa Wonder Tower! The second is topped by a metal sphere, and the third has some sort of pulley contraption on top that seems unfinished. 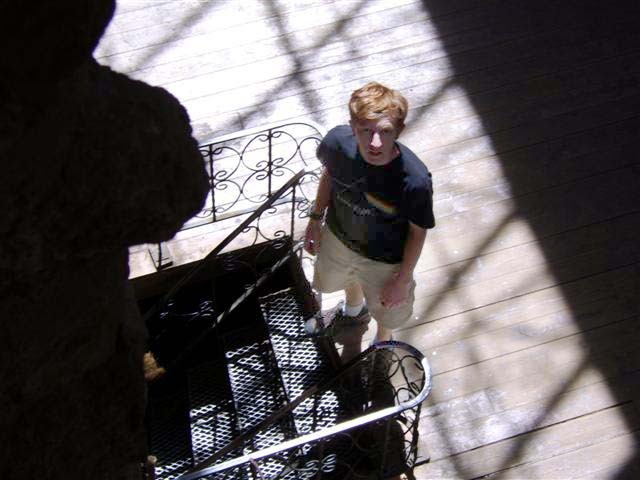 Here's Ryan in the sanctuary, near one of many ornate iron staircases. Kristina is in the sanctuary, Dan's looking down from a window. 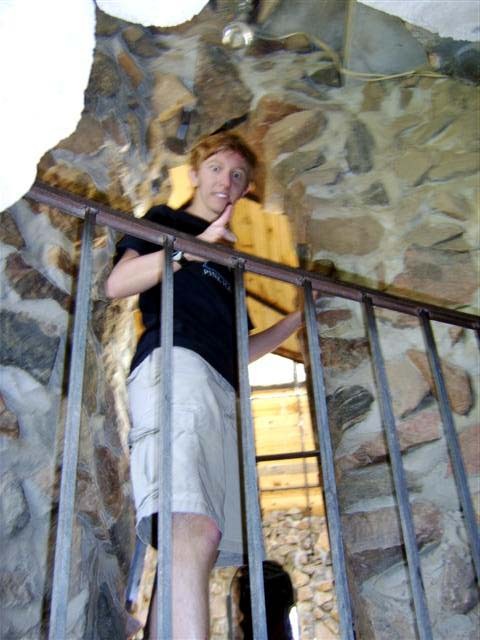 All over the castle are stairways to nowhere and precarious ledges with no railings! Neat, danger! 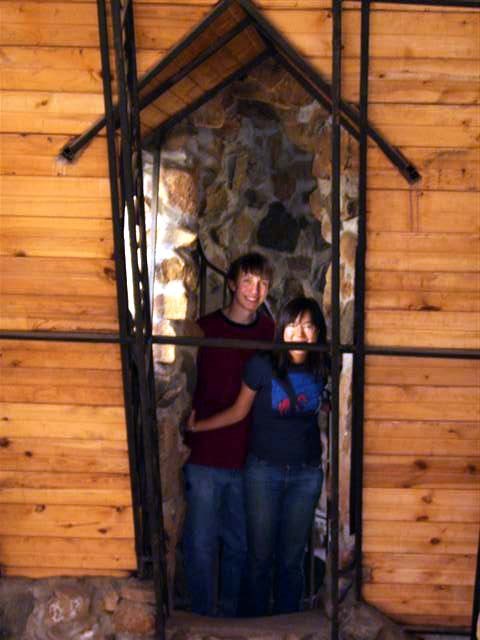 Nick and Kristina poke their heads out from a window above the sanctuary. The platform they're on is 20 feet above the sanctuary floor and accessed by a spiral staircase in a stone tower. 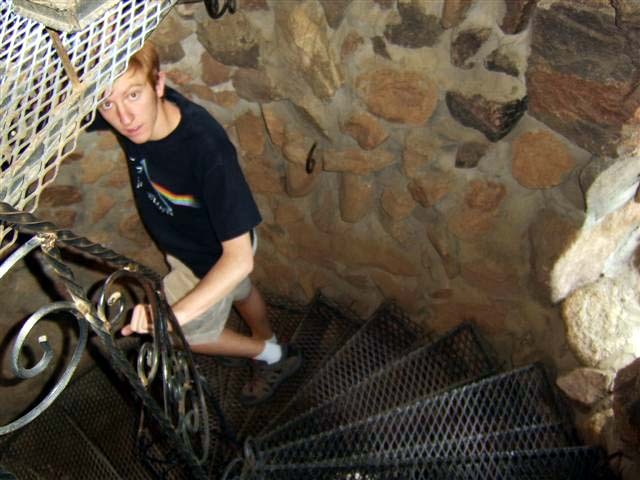 There are all sorts of amazing passages and dark stairways all over the castle! Ryan is in one of the towers, looking out into the sanctuary. 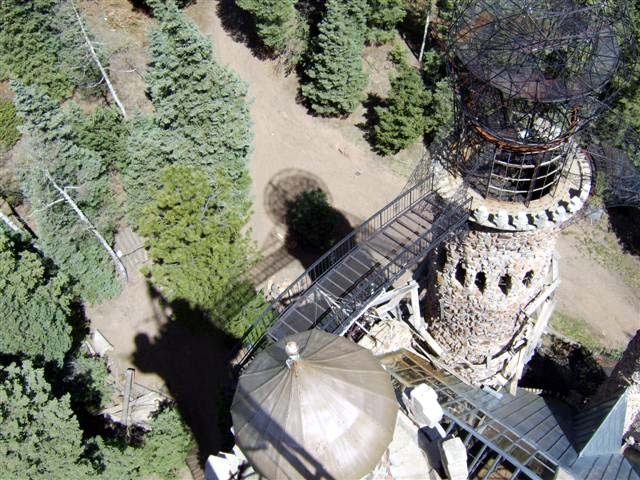 Of course, the absolute coolest part is the fact that you can climb to to the top of any of the towers. This is the view from the tallest spire. This spire is almost entirely surrounded by stone with an iron staircase running up the middle. The last 20 feet or so, however, is just an iron frame supported by the stone below. The height is absolutely incredible and vertigo-inducing! In the top right corner, you can see the iron sphere at the top of the second spire. Here's a look at my feet. Not only is the top 20 feet of the spire made of iron, but the very top step is actually a higher, ttriangle-shaped platform perhaps 18 inches long on each side. 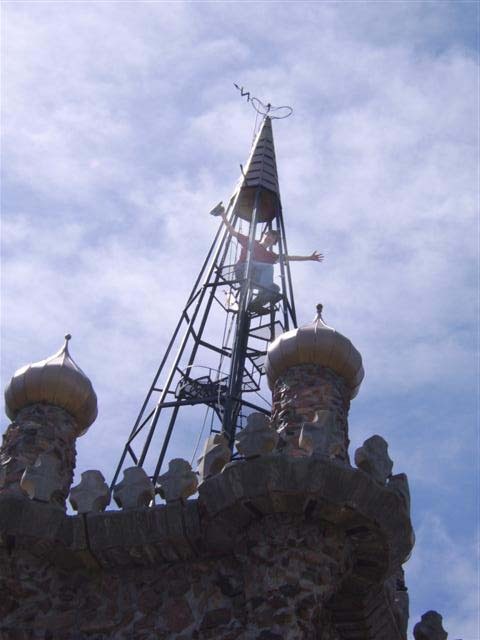 One of the sides of the triangle has a railing, one leads back down the staircase, and the last is railing-free, supported by the frame running up the outside of the spire. Standing here makes one's knees extremely wobbly. 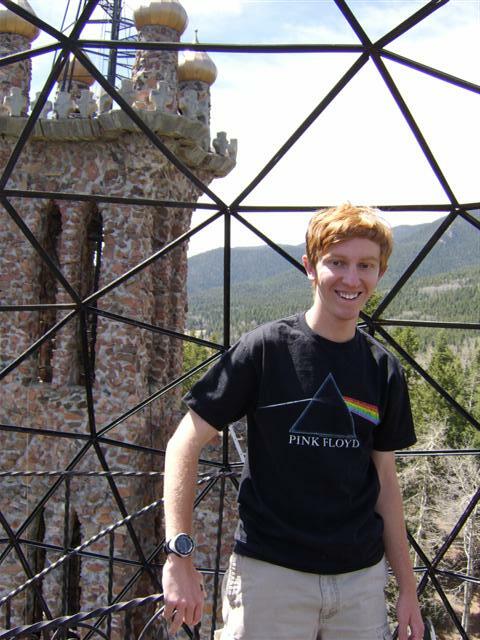 Here's Nick at the top of the same spire, taken from the second, lower spire. Moms: don't worry, he's sitting down on the platform I was just standing on. 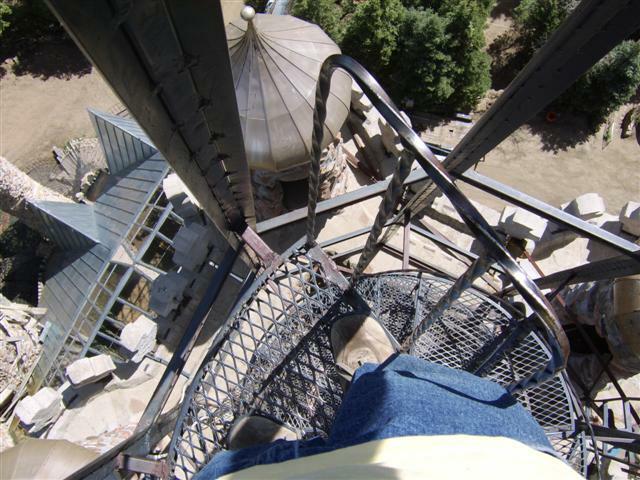 This is Dan in the sphere on the second spire, taken from the third spire. Again, incredibly high. Dan in the sphere, taken from inside. 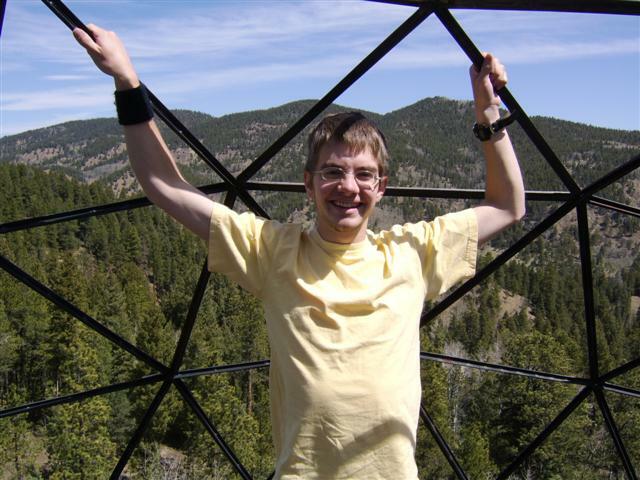 This is Ryan in the second-spire sphere. 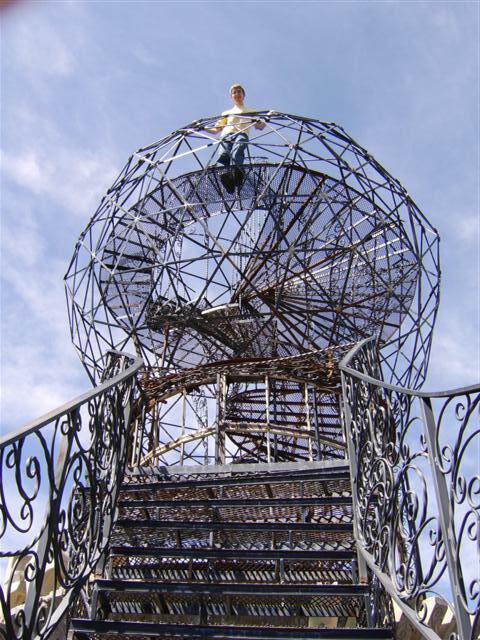 He looks extremely nervous, since the wind is blowing hard and the welded iron structure is wobbling noticeably. 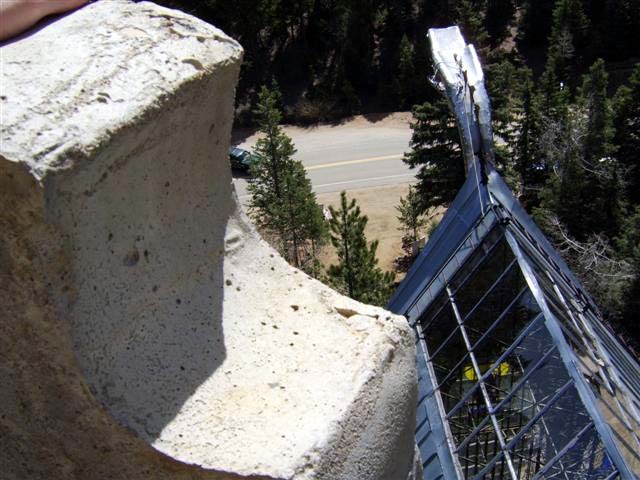 A view of the highway from the third spire. From here, you can see the back of the dragon's head. Everything in the castle is made by Jim, including, unfortunately, the latrine.